A McDonald's Monopoly campaign which sees customers given the chance to win prizes including food is a "danger to public health", says MP Tom Watson. He said the fast food giant should drop the annual competition, which starts this week, saying it encouraged people to order more, the Observer reported. It comes as the government considers banning junk food adverts on TV before 9pm to tackle childhood obesity. McDonald's said "customer choice" was at the heart of its business. Will new child health measures make your life easier? Mr Watson - who tackled his type 2 diabetes by adopting a healthier lifestyle and losing seven stone - has asked Paul Pomroy, chief executive of McDonald's UK, to cancel the marketing campaign, according to the newspaper. 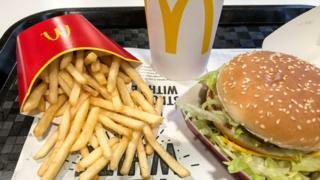 But McDonald's argued that people can take part by buying some of the healthier foods on their menu - and that they no longer get extra chances to compete by buying larger items. Image caption Tom Watson says the competition is "appalling"
They said in a statement: "This year's campaign sees customers receive prize labels on carrot bags, salads and our Big Flavour Wraps range, and we have removed the incentive to 'go large'. "Nutrition information is clearly displayed and we continue to review, refine and reformulate our menu to reduce saturated fat, salt and sugar." A public consultation is beginning on whether there should be a watershed for TV and online adverts featuring foods high in fat, sugar and salt. Junk food ads during children's TV shows have been banned since 2007. The UK is facing a crisis over childhood obesity, with up to 1,000 more children per year expected to require treatment for severe obesity-related problems by 2022-23, the Department of Health and Social Care has said. In his letter, Labour's deputy leader Mr Watson wrote: "Almost two-thirds of adults in England are overweight or obese. "A quarter of children in England are overweight or obese by age five, rising to over a third by the end of primary school. Obesity and a sugar-filled diet cause a variety of serious health conditions, including type 2 diabetes which costs the NHS 10% of its budget every year to treat. "In this context, it is appalling that your company's Monopoly marketing ploy encourages people to eat more unhealthy foods by offering sugar-filled desserts as rewards. "It is unacceptable that this campaign aims to manipulate families into ordering junk food more frequently and in bigger portions, in the faint hope of winning a holiday, a car, or a cash prize many would otherwise struggle to afford." Type 2 diabetes affects one in 16 adults in the UK and causes the level of glucose in the blood to become too high. It is strongly linked to diet and lifestyle. It is the more common form of diabetes, with nine out of 10 people with diabetes in the UK having type 2. Type 1, on the other hand, is an autoimmune condition and is not associated with being overweight or inactive. Mr Watson added: "It is clear that McDonald's Monopoly is a danger to public health. Businesses have a moral responsibility to their customers, and as a society we have a responsibility to safeguard the health of our children." The campaign, based on the board game of the same name, sees customers either collect stickers in the hope of winning big prizes or being given instant prizes such as free food.